The Customize Windows > Computer and Internet > Browsers > When Load Balancing is Required ? When Load Balancing is Required ? How you will decide that your website or server needs Load Balancing? Number of pageviews per month does not determines it. Only the visitors or number of pageviews is too much flawed metric to determine the need of Load Balancer. Also, with false sensation that a Load Balancer will save you from downtime can increase your spendings without any reason. So, again we are back to the basic question – When Load Balancing is Required ? It is very pathetic question to ask to the service provider “When Load Balancing is Required ?” If you were the service provider, you would also try to at least exploit the question by asking – “Well, at least test it once!”. A witty business trick. First know the basics of Load Balancing. Load Balancing really means the word it has within it – balance the load for maximum performance. We actually can use higher RAM, CDN, Cache to reduce load – that is basically not the reason to use a load balancer. Indeed, you can use load balancer for your computer’s internet connection too ! That is what we have said in the article – Internet load balancing and Multiple Internet Connections. That was possibly not in your calculation that you can use a kind of load balancer for your computer too. Our computers has practically no difference with a Server, except the big fact – out port 80 is usually closed. As a computer with IP, it also requests GET requests via the browsers. So, it is important to know the Mechanism and Types of Load Balancer. What you understood in the article linked above which guides you to configure load balancing for your computer’s internet connection ? It made a fail-proof system, right ? It basically made the computer’s connection scalable. If you need Scalability, Redundancy and to some extent Performance, Load Balancing is required. This website has medium amount of traffic, but the gush often is from social networks. So we need to make sure that it is scalable. To enforce the balance of need and cost – we need a logic so that, the load balancers are automatically allocated. Definitely, adding load balancer indirectly helps to increase the page loading speed – you can lead that topic – How To Configure To Speed Up Your Blog. 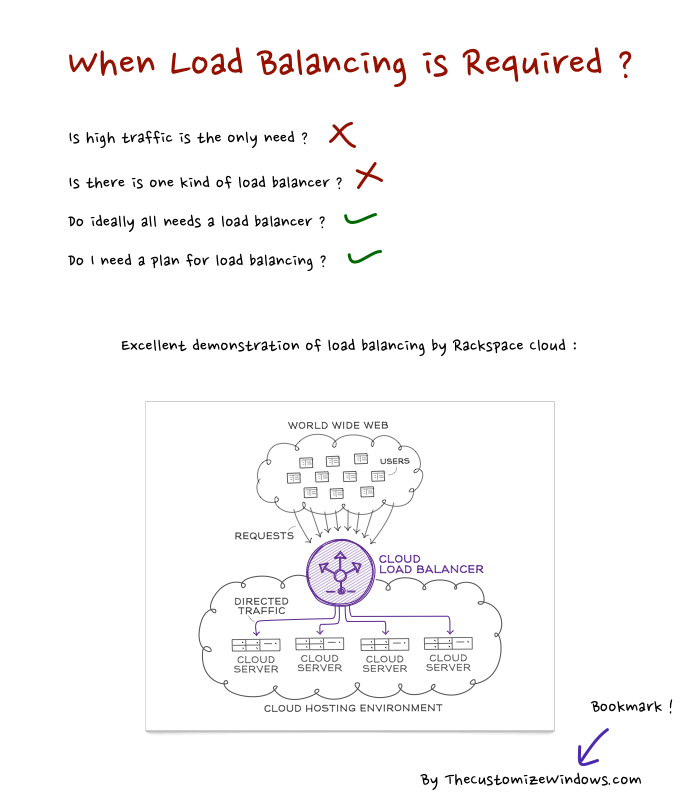 May be, you need more basic idea about Load Balancing written here. Today, all top notch service providers has Load Balancing Service – you can just add and remove via API. First you can add via scripting or through any control panel, like we wrote in Installing Load Balancer OpenApp NAP on Rackspace Cloud Server. Basically all needs load balancing to use the server resource uniformly just like using a CDN is a need. Its the budget that prevent us to use load balancer. If you can calculate your compute cycles, which is basically impossible to calculate when cPanel specifically is installed because itself cPanel add some extra load on the same server (that is why we always say to avoid cPanel, its a real devil both for the server and the users’ understanding that a server is basically a computer) and it abnormally shows a up trend of cpu consumption, that is a need for using a load balancer – users are giving GET requests but probably the bandwidth reaching the practical limit – a tube delivering water can not deliver as much you want and the diameter has a physical limit. Then we can add multiple tubes. Basically it is another type of load balancing – hardware load balancer instead of DNS load balancing. The whole setup can build a Load Balanced Cloud with High Availability. Lot of things to read ? Actually, for billion page views per day, we need the physical machine for tweaking, then the need for a colocation server starts. The pump – self owned motor or pump. The tubes are rented. Bigger websites like Microsoft, Apple has own ‘Tubes’, ‘water supply’ too – this is to get the most dedicated setup, which is in practical life is not possible with colocation plus other factors are there like privacy. Articles Related to When Load Balancing is Required ? Title: When Load Balancing is Required ? Cite this article as: Abhishek Ghosh, "When Load Balancing is Required ?," in The Customize Windows, June 30, 2013, April 25, 2019, https://thecustomizewindows.com/2013/06/when-load-balancing-is-required/.